Continental installation are accredited to the internationally recognised standards of ISO 9001 – Quality Management and ISO 14001 – Environmental Management. 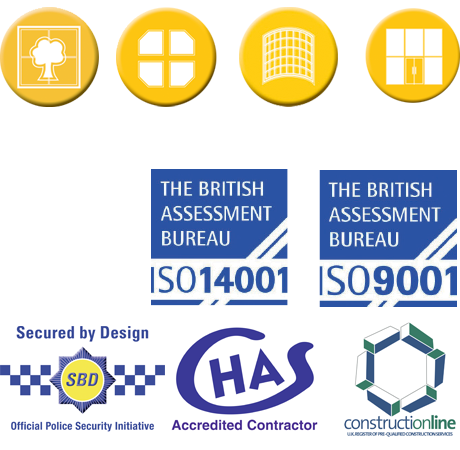 We maintain accreditation with Constructionline and Secured by Design and our processes are audited by BM TRADA, Enhanced Security Door Scheme to PAS 24 and Enhanced Security Window & General Performance Window Schemes toBS6375 and PAS 24. We maintain on going competencies for IPAF, PASMA and CPCS and our delivery drivers are trained to ALLMI. We have developed successful working relationships with several of the industries leading suppliers based on their technical capabilities, quality of product, service and Environmental credentials. We have the facility through our supply chain to direct our customers to the latest Building Information Modelling (BIM) to provide bespoke design solutions.